Understanding how the human central nervous system (CNS) is built has become a core priority in biological research. 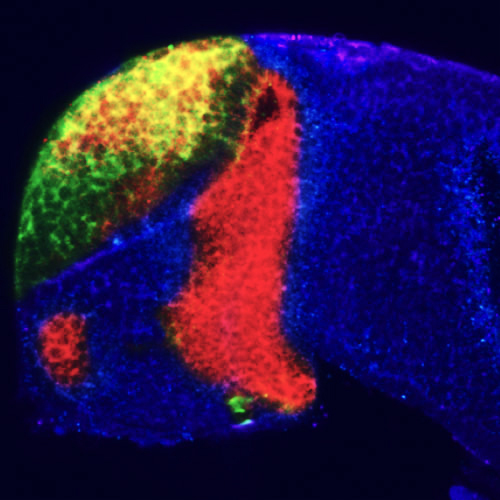 The past 20 years have seen substantial progress in deciphering the fundamental processes driving CNS formation in animal models with a focus in finding conserved mechanisms underpinning brain regionalisation, tissue and cell morphogenesis, neurogenesis, neuronal/glial fate specification and neuronal migration. These conserved mechanisms drive the progressive organization of a functional CNS. However, the mechanisms dictating its species-specific attributes are not yet understood. Uncovering these will reveal the molecular drivers of our human neural identity. We have now gathered the knowledge, tools and technologies to tackle this enigma and understand the mechanisms generating diversity in CNS shape, size and complexity, with the ultimate goal of understanding what is making our CNS human. What are the cellular and molecular mechanisms shaping the CNS? How and when is cellular diversity defined and how is it tweaked by evolution? What are the evolutionary dynamics controlling changes in cellular decision during CNS development? How early in development are CNS species-specific attributes defined and are these irreversible?